Tapioca known as maravalli kizhangu, kuchi kizhangu or kappa kizhangu is family favorite. We buy when ever we find. I got few last week from mustafa and boiled with salt for Vj and had 2 more remaining. Was thinking to try out chips, then I got this recipe from Sumathi akka here and thought to give it a try. 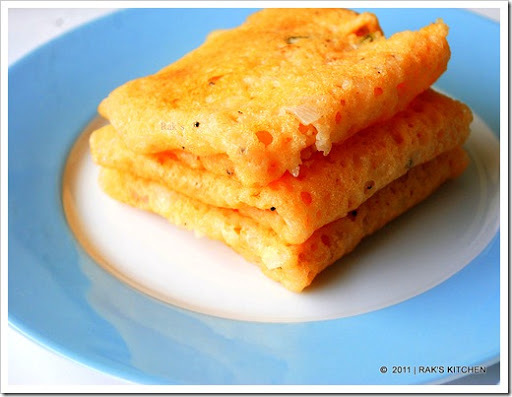 It is very simple and easy recipe, and it feels full when we have it for breakfast. Vj liked it very much and I too loved it. Soak rice for 3 hrs minimum. Cut and peel tapioca. Chop them into small cubes or you can even grate it. Add red chilli, pepper, cumin seeds and cut tapioca to the blender. Grind it with little water. Transfer to the mixing bowl. Drain water from soaked rice and grind it with little water. It can be ground coarsely (finer than rava) or smooth too. Add to the mixing bowl. Add salt, finely chopped onion and curry leaves. Mix well. Adjust the consistency of the batter, it should be thick like adai batter. Heat a tawa and drizzle with oil. Spread a ladle full of batter and cook covered in medium flame. Flip and cook for a minute. You can make as soon as you grind. This batter should need not be fermented. Instead of onion, you can add asafoetida powder and little grated coconut and make adai. Serve hot with coconut chutney, the best combo for this adai. an excellent recipe. now a days this tapioca is available in plenty at very modest rates. thanks for the recipe. Can we use the store bought tapioca balls instead? If so, would there be changes to the ratio? Please suggest, thanks! Tapioca balls are processed much and cannot relate to this one, if you want you can soak 1/4 cup together with rice and grind and try. Cool :)love tapioca definitely will try this..
Nice one Raji. Pics are inviting. Do visit my blog when you have time. I only have frozen tapioca (we call it cassava). Can this be used? If so would any adjustments be needed? Just Thaw and grind it. I use Amul milk and milky mist curd to set. can i use cooked one as well?